General. No 3 Service Dress covers all forms of field exercise clothing, including the Combat Soldier 95 (CS95) range. Field exercise clothing is defined as clothing that is required to be worn for training and exercises. CS95 is not issued as part of the initial kitting scale for either male or female personnel. PCS / MTP uniform are not to be worn. a. 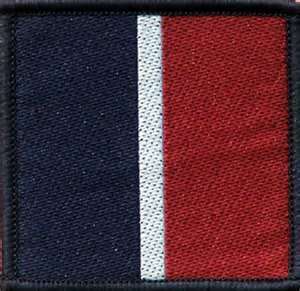 The union jack emblem, when worn, is to be positioned centrally 5cm below the shoulder seam on the left arm. 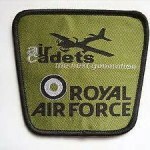 the Air Cadets Adult staff patch (WO/SNCO (ATC) and cadets) is to be affixed centrally and immediately above the right hand breast pocket of the CS95 field jacket and shirts only. 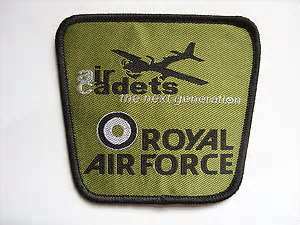 The green patch measures 16cm x 3cm and is embroidered in black. 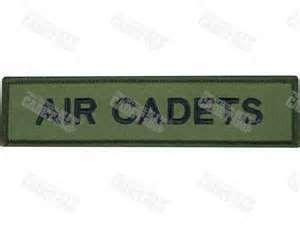 the ACO Staff Formation Flash (WO/SNCO (ATC) only) replicate the colours of the RAF Stable belt with the addition of an eagle and ‘AIR CADETS’ embroidered in black on the ACO Staff Flash. This is the only approved version and any other design or copy available through civil sources is not to be worn. Tip: In order to make sure the TRF stays creased and flat, use the spray function on your iron (if it has one) and completely soak the flash. Then run the iron over the flash until the water has evaporated. Be sure not to leave the iron in one place! It will burn your uniform! Embroidered name badges are not worn on CS95. 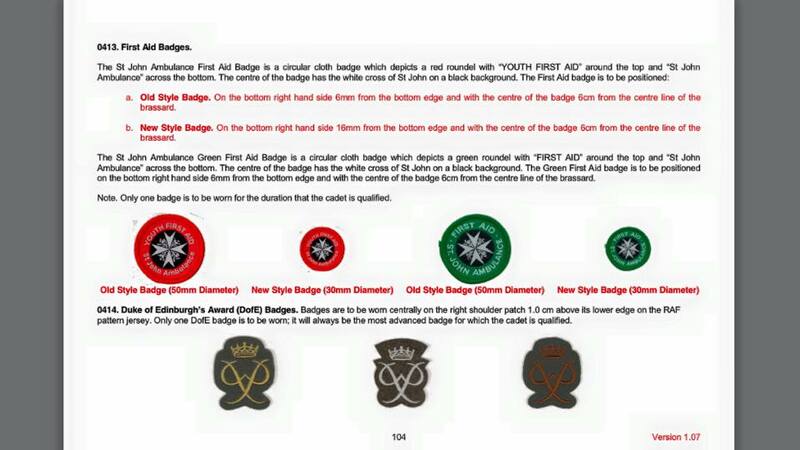 All other authorised insignia or badges are to appear below these emblems. 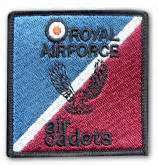 Sections will be expected to wear No 2 SD unless a new standing authority to wear CS95 routinely is given by the Comdt Air Cadets – this decision cannot be made by officers from other services. 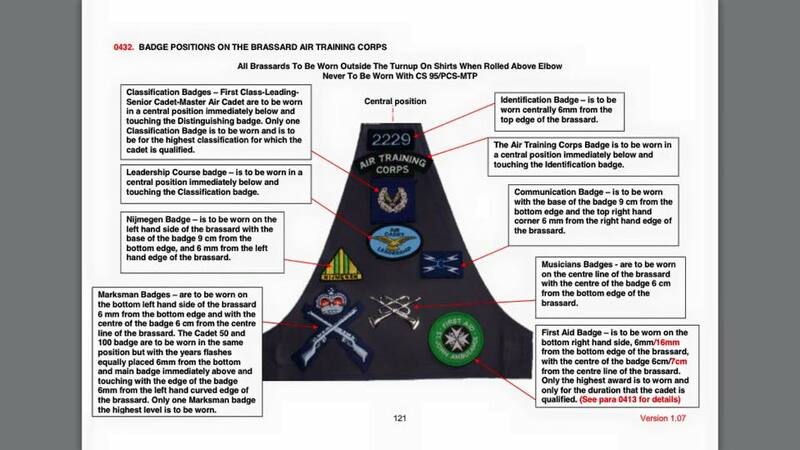 Furthermore, ACO personnel should not wear accoutrements affiliating them to non-RAF organizations such as stable belts, regimental berets and badges; only ACO approved variants are permitted. Civilian Instructors/ Padres are not to wear CS95 or any other DPM clothing. They are to wear appropriate / equivalent hard-wearing civilian clothing. CS95 Authorised Ensemble. When authorised to wear and except where a specific order of dress has been prescribed through the OC Wg / Wg Ex O/ Sqn Ldr CCF HQAC, only the approved CS95 ensemble, as detailed below, is to be worn. 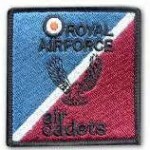 Appropriate RAFVR(T) or ATC Insignia must be worn at all times. a. Head-dress. The service issue beret is the only head-dress to be worn, with appropriate hat badge by all ranks. b. DPM Field Jacket. No shoulder epaulettes, rank slide worn on the front rank epaulette. c. DPM Lightweight Combat Suit (L/W Jacket & Trousers). No shoulder epaulettes, blue rank slides only are worn on the front rank epaulette. d. T-Shirt. All year round wear under garment of an appropriate colour, (green, brown, black) Unit insignia should not be visible. e. OG Norwegian Shirt. Under garment for cold conditions. f. Fleece Liner (OG/DPM). Cold conditions undergarment, or suitable mid layer, not to be worn as outer layer. g. DPM Moisture Vapour Permeable (MVP) Suit. Lightweight Gortex waterproof jacket and trousers. h. Gloves. Black gloves, appropriate to the task. i. Boots. Black combat style boot.